Senior guard Mei-Lyn Bautista dribbles the ball during an Atlantic 10 game last season. The opening game for women’s basketball revealed glaring holes on offense after the team graduated its two leading scorers from last season. 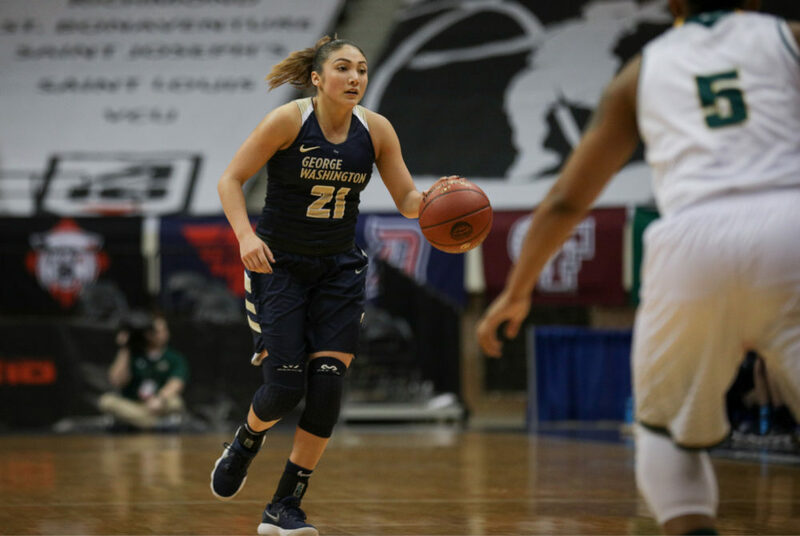 GW (0–1) lost to James Madison (1–0) 50–37 on the road Thursday night, and the loss showed the Colonials’ offensive weakness as they struggled to get points on the board throughout the night. The Colonials finished the game shooting just 24 percent on the night (12-for-51) against a swarming Dukes defense that converged on the team’s interior offense. When they drew fouls, the Colonials only converted free throws at a 48 percent clip (10-for-21). An athletic department spokesman declined to provide interviews with athletes postgame, citing a department policy. Senior guard Mei-Lyn Bautista and sophomore forward Neila Luma combined for half of GW’s 12 field goals. Bautista, who was on the court for all but four minutes, carried the team on both sides of the ball, checking in with 10 points, four assists, three rebounds and five steals. Luma led the Colonials in scoring with 11 points of her own, despite struggling with her touch around the rim. The sophomore from Macungie, Pa. hit only 3-of-11 shots, but visited the charity stripe nine times. James Madison was led by junior guard Kamiah Smalls, who tallied 14 points and seven rebounds on the night. It was an uphill climb from the start for the visitors. GW faced an early 10–0 deficit, going scoreless for the first six minutes of the contest. A turnaround bank shot at the three-minute mark by freshman center Kayla Mokwuah broke the drought for the Colonials. When the first-quarter buzzer sounded, GW was trailing 16–8. Smalls, the Colonial Athletic Association Preseason Player of the Year, alone outscored GW 9–8 in the first frame. Senior forward Kelsi Mahoney struggled to find space on the perimeter, going 1-for-8 from the field throughout the game – all three-point attempts. “When teams take away Kelsi the way JMU did and stay focused on not letting her get open looks from three, we have to find different opportunities to get to the basket and get easy baskets,” Rizzotti said. But things began to click for GW in the second quarter. Mahoney knocked in her only triple of the night to narrow JMU’s lead to 18–15, and then it was the Dukes’ turn to go cold. The home team then saw a five-minute scoring drought, but the Colonials could not convert and a rare Bautista turnover led to a three-pointer by James Madison junior guard Lexie Barrier that killed any momentum the visitors gained. The Colonials trailed by seven points coming out of the locker room with 20 minutes to play. To open the half, James Madison hit a three-pointer followed by two quick layups to widen the deficit and put James Madison up 12. After that, both teams traded points, including five by Luma, but Bautista answered with a solo 6–0 run that put the score at 39–33 and got GW back in the contest. Rizzotti emphasized that in the few moments the Colonials were successful on offense, they made an effort to score in the paint. “When we started working closer to the basket, it opened up the game for us a little bit, so we just have to do a better job of finding those opportunities to get post touches and get easier opportunities to score so that we can continue to set our defense and be really disruptive on the defensive end,” Rizzotti said. As the contest continued, GW was plagued by missed free throws and botched layups that held off any chance they had of completing a comeback. In the fourth quarter, GW scored just four points while the Dukes ran away to 50 to finish the game. The Colonials will be back in action 2 p.m. Sunday for their home opener against Princeton. The team’s Atlantic 10 Championship banner will be raised in a ceremony before the game.